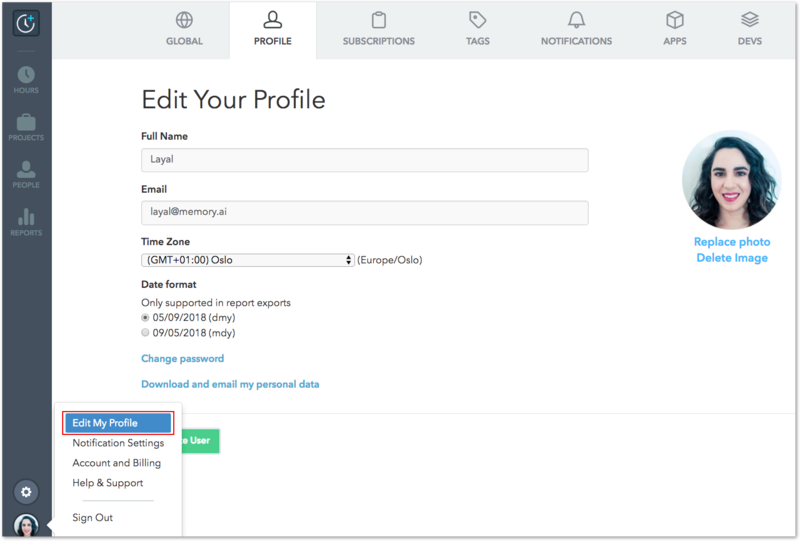 The Profile page lets you edit your name, change your email address, update your password and replace or delete your profile pic. You can also adjust your time zone and set your preferred date format for exporting reports. If you work with a team, edits made from the Profile page will only affect your personal account; they won't change company-wide settings on your Timely account. Click your profile picture icon in the lower-left corner of Timely and select 'Edit My Profile' to be redirected to the Profile page. You can also add, change or delete your profile picture. Get creative! Just make sure the dimensions are 200x200, or you might have trouble with the upload. Read this help article if you're changing your email address in Timely. If you are changing an email address that is linked to your billing, please contact Support via your in-app chat bubble so we can make sure it's updated for your invoices as well! It's good practice to change your password regularly. The 'change password' link will prompt you to enter a new password; you'll need your current password to make the change. Note: Passwords must be a minimum of 8 characters long. Timely's default date format on exported reports follows the international standard of day/month/year. Timely users in the U.S. and those with North American clients can change their preference on a personal account basis to month/day/year, to make life easier. You can have your Timely personal data downloaded and emailed to you at any time. Just click the link, and wait to receive the email. The size of your file will affect how long it takes for you to receive the email.